We manufacture sturdy and hard wearing Road Milk Tankers using premium quality raw material including metals and alloys offering sturdy and hard wearing road milk tankers. These are meant for faster and convenient transportation of milk via roads from plant to final destination. 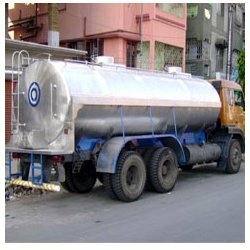 These tankers have insulated tanks with inner surface made up of SS-304 and outer surface with mild steel which helps in retaining the nutrients of milk for long hours. Looking for Milk Tanker ?